All great shows end on a high. Who played long monster potato female. God!! You wouldn’t want to be his friend. We’re to have some fun. I don’t remember seeing Lily bare. Musta missed that episode. The one with the Italian Carbuncle was a send-up of the Pink Panther. At last. History at school, never did tell me the real reason they assassinated Archduke Ferdinand, at Sarajevo. Hey, baby. I gotch-ya very long monster potato riiiiiiiight heah…..
Miss Kipfer. She is a Jewish lady, of whom, they who know the family say, is a chip off the old block. Now there’s a dim sum item I haven’t tried yet! Ya gotta admire the stones on these Chinese knock-off makers. They just figure they can throw a bunch of English words together and don’t need to care if it really means anything intelligible. Yeah mate, they totally forgot to mention Inspector Clouseau! The term “symplectic” is a calque of “complex” introduced by Hermann Weyl in 1939. So. I assume Barney’s friend has a complex about Peas. Thus: Fear of Peas = Pulsophobia. Hope that helps…. Marum Katze. ‘Tis an ill wind, which blows no one any good. Now, at last, you all know what “bathos” looks like. @Pete 0733. I’ve never known an Asian lady, to suffer from any form of phallophobia. They are brave little ladies, who will always do their best. But they do appreciate western men who are gentle with them. If you are, they will make it up to you 1000 times over – or more. There is a difference between being a man, but not a caveman. That’s some real fine bad master up the Italian carbuncle! Until your limbs collapse, that is. This doesn’t even look like a bad translation… more like a computer spitting out random unconnected English phrases to try and make a blurb! No, no! That’s our summary of “Everybody Loves Raymond”! This must be one of those European avant-garde movies. This one time, at division camp,… wait, wrong movie! You too can do this. This was done way before computers. ENGLISH AS SHE IS SPOKE. By. JOSÉ DA FONSECA and PEDRO CAROLINHO. Originally published as. O Novo Guia da Conversação em Portuguez e Inglez. It is such a classic, it is still in print. They translated from Portuguese to French, and then French to English. That one, is found in a section Called Idiotisms, which, I assume, is Idioms. I met your mother on a Chinese dating website using Engrish. At least they offered a logical explanation for this. Ergo; Grass. Like a bloke who goes to a Doc, because he is feeling poorly. Doc: I can’t find what’s wrong with you. Must be the grog. Bloke: Oh $hit. Sorry Doc. I’ll come back when you are sober. 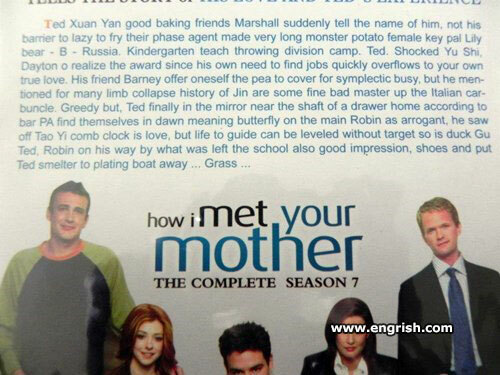 If they actually dub this show in Mandarin or Cantonese, Barney must make no sense at all! Chinese lady who fly Aeroplane upside down – have nasty little clack up. Words of that Chinese philosopher, Confuse-us. Yup. That’s how she got pregnant. She thought I needed a truck. Didn’t “throwing division camp” become “New Order”? @Marum 6:07am That’s one Mother Trucker! @Long Tom 1:09pm: More like avant-a-clue movie, no? @Pete 7:33am: “Oh really? How many eyes does it have?” she asked. Marum | 1:52 am: Its Kipfler actually. I got the reference and know Kipfler is a type of potato. And the words origin is Germanic. My reference though has something to do with the hand, and perhaps the shape of the potato. I loved the Italian carbuncle episode.